Sunset From The Orchestra Seat Porch! Beds: 1 queen, 2 doubles, 8 twins, Grandfathered at TWICE local cap! ''Best House! Best Beach! Most Bedrooms!'' Only Cape Cod Beach ranked U.S. Top Ten Family Friendly (Tripadvisor.com). 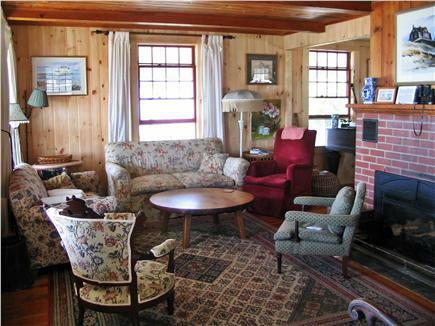 Wellfleet has a 4 bedroom cap. Only ''Cottage'' grandfathered double bedrooms! Only Historic Bluff home to receive a ''Harry Truman White House'' total reconstruction and a ''Jacqueline Kennedy White House'' art & antique appointing. Only Bluff Cottage Grounds manicured to CDC ''Tick-safe Zone'' Guidelines. Only ''private jet'' to Paradise at less than ''coach'' per person. Visitors to Chequessett Bluff, with its wondrous, sweeping, Cape panorama, invariably erupt into nonverbal exultations of pure, aesthetic joy. Every eye flashes and every breath catches in childlike delight. The views really are that spectacular. And the venue is family perfect. 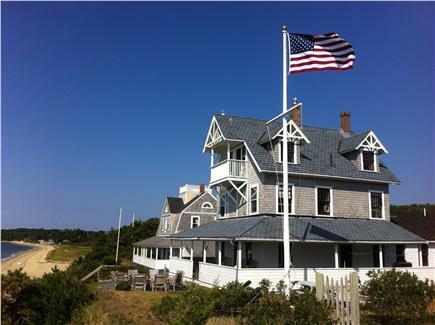 This waterfront, three story home, with its wide porch and private beach, is one of the original Chequessett Inn Bluff Cottages built in the early 1900's by Sea Captain and banana tycoon L.D. Baker for friends and special guests. 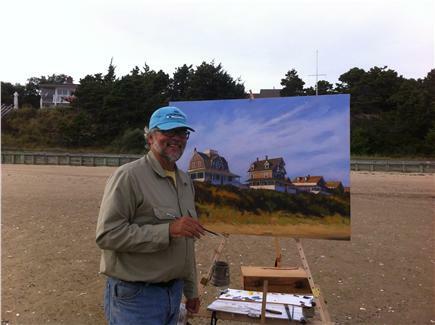 Edward Hopper, who famously painted the ''beauty beyond language,'' immortalized this home in his ''Cottages at Wellfleet.'' The house retains its original, now restored, Eastlake furnishings, its lovely, historic, Cape Cod charm and, because of its era, it stands taller, and is closer to the water than modern codes allow. Seagulls soar below you. The grandfathered bonus bedrooms make the home a one of a kind ''three cottage'' cottage where the comp conscious cost may be split with no drawn straws to see who's stuck on a pullout couch. Inviting bay waters are warm. There's a safe, prevailing, onshore breeze. When a sou'wester picks up, windsurfers and kite boarders literally fly. Kayak to The National Seashore's Great Island or behind the neck to the Herring River. Explore the estuaries at low tide. Stroll past the world's most famous oyster beds to Wellfleet Harbor for ice cream, sushi or lobster. Tell your loved ones to ''Go fly a kite'' and prepare for decades of gratitude. Additional availability info: CALL WITH SPECIAL REQUESTS. This is a Sunday to Sunday vacation rental. Additional pricing info: No security deposit. Changeover fee $400. State and local taxes of 12.45% will apply. We have stayed for three summers in a row in this perfect cape house. The house is warm and inviting, the view from the patio is breathtaking, and the beach just down the steps completes the dream vacation. The bay is warm and safe for our kids to swim in while the grownups can watch from above. A walk (or kayak) to Macs for the best seafood around. The owner is very friendly... it is just what you want when you want the Cape.